Franklin Mills flat-drawer cabinets feature a convenient stackable design that helps you make the most of your floor space. Our unique file storage is capable of housing a number of large flat items. All of our cabinets feature stainless steel tracks and plated rollers that eliminate contamination from flaking paint. Cabinets can be stacked two units high in the same floor space while providing a useable extra working surface. 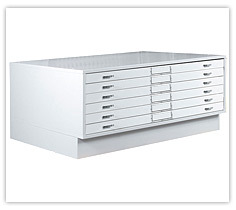 Click here to view our flat file storage cabinets brochure.